TEMPE – Several senior centers across Arizona are knitting, crocheting, sewing and quilting to help the poor. Two such groups are the Tempe Needlewielders and Knit 4 Needy. From scarves and caps for newborns to wheelchair bags and fidget bibs for nursing home residents, volunteers create items they donate to charities, including the American Heart Association, Chemo Companions, Refugee Focus and the Purple Society. The act of creating something for someone else is rewarding for the volunteers, too. 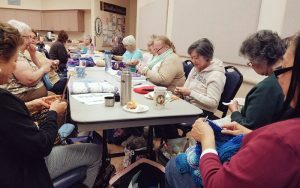 “I’ve gotten emails and pictures of people who had nothing … who are now wearing a hat one of the ladies made, or a scarf or a blanket” said Nanci Hannon, chair of Knit 4 Needy, which meets at the Via Linda Senior Center in Scottsdale.